This is the 11th annual Corporate Responsibility report produced by Bacardi Limited, the largest privately held spirits company in the world. It focuses on our work to manage the social and environmental impacts of our business. This report relates to fiscal year 2018 (April 1, 2017 to March 31, 2018). 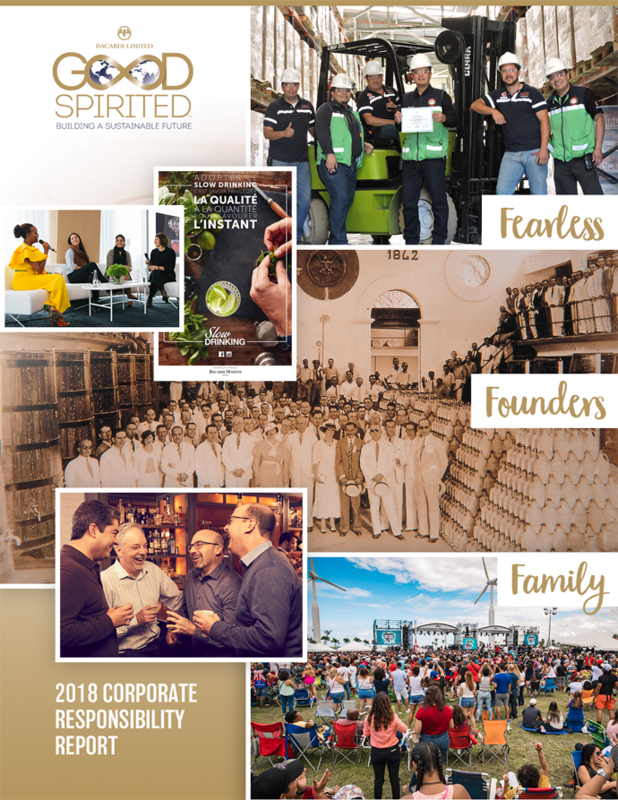 For comprehensive information regarding Corporate Responsibility at Bacardi Limited, please visit our website www.BacardiLimited.com/corporate-responsibility. This report contains Standard Disclosures from the GRI (G4) Sustainability Reporting Guidelines. The report provides an overview of our progress against targets in our five core pillars: Marketplace, Environment, Responsible Sourcing, People, and Philanthropy & Community Investment, as well as future targets in each area. There have been no significant changes in the scope or boundaries of the data we are reporting this year. Data presented in the People and Philanthropy & Community Investment sections, as well as Safety data from the People section, cover our offices and our directly-owned and managed production facilities. Data on indirect GHG emissions cover our directly-owned and managed production facilities and large offices with 25 people or more. All other environmental data cover our directly-owned and managed production facilities. Performance data from our suppliers, outsourced bottlers, and co-packers are not included. Any restatements of data are noted in the relevant sections of this report. Data has been compiled following the GRI indicator protocols. Data measurement techniques and assumptions are cited in the relevant sections of the report. The WRI/WBCSD Greenhouse Gas Protocol was used to compile our GHG emissions data. Bacardi Limited refers to the Bacardi group of companies, including Bacardi International Limited. Any reference to “Bacardi” as a Company in this report refers to Bacardi Limited, one of its subsidiaries or a group of Bacardi companies. For more information on Bacardi Limited’s corporate structure, brand portfolio, and location of operations please visit www.BacardiLimited.com. We would like to hear from our stakeholders on our 2018 Corporate Responsibility report. Please email us at CorporateResponsibility@Bacardi.com.